A new owner is being sought to save Scotland's most southerly whisky distillery. 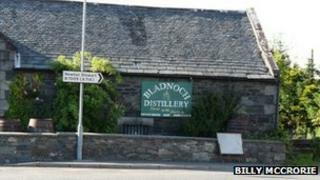 The Bladnoch Distillery and Visitor Centre - near Wigtown - is owned by a company based in Northern Ireland which has gone into liquidation. The distillery entrance is currently chained off and a sign says that it is closed until further notice. It is hoped the site can be sold as a going concern. It has fewer than 10 employees. Bladnoch Distillery dates back nearly 200 years. For the past 20 it has been run by Raymond Armstrong - a businessman with a passion for whisky who spotted the mothballed facility during a holiday in Galloway in 1994 and bought it from United Distillers who had closed it a year earlier. Mr Armstrong spent six years restoring the plant, and production of its distinctive Bladnoch lowland malt re-started in 2000. It is a popular tourist attraction with a visitor shop and guided tours. It is understood that the parent company - Co-ordinated Development Services based in County Down - called in the liquidators last week. Accountants Ernst and and Young have been appointed to dispose of the assets - and it is understood they hope to sell Bladnoch as a going concern.